"WHAT ARE MODERATE LEARNING DIFFICULTIES?" Pupils with Moderate Learning Difficulties (MLD) will have attainments below expected levels in most areas of the curriculum, despite appropriate interventions. Their needs will not be able to be met by normal differentiation and the flexibilities of the National Curriculum. They should only be recorded as MLD if additional educational provision is being made to help them to access the curriculum. Pupils with Moderate Learning Difficulties have much greater difficulty than their peers in acquiring basic literacy and numeracy skills and in understanding concepts. They may also have associated speech and language delay, low self-esteem, low levels of concentration and under-developed social skills. 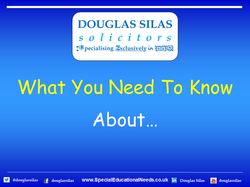 See ﻿Learning Difficulties ﻿for more information.